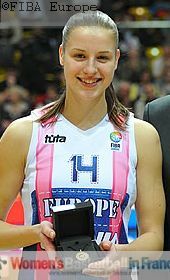 The EuroLeague Women All star game was interrupted after 60 seconds to present Hana Horakova with her player-of-the-year award. 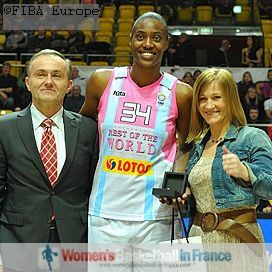 With the match resuming, Sylvia Fowles opened the scoring with just over a minute played for the Rest of the World. Sancho Lyttle replied almost immediately for Europe and the match took off. Neither side was defending as both sides traded basket for basket for the first five minutes with the Rest of the World leading (15-14). The second part of the first quarter belonged to the Rest of the World as they hit shot after shot from beyond the arc to lead (40-24). Europe started to play a little harder at the start of the second quarter. With three-pointers coming from Liron Cohen and Katerina Elhotova, the team Europe's deficit dropped below 10 points. For the remaining time the two teams traded baskets with the Rest of the World getting the upper hand to head into the half-time break leading (61-47) with every player on the score sheet. During the interval the three-point shooting contest took place with Katerina Elhotova for Europe and Alexandria Quigley for the Rest of the World going into the final round. Yet it was Elhotova (right) who won this competition. Then the second half of the match was played with still very little defense. 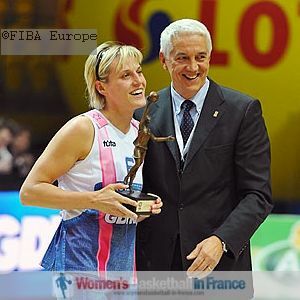 But it was higlighted by some nice passes from the Europe team by Céline Dumerc (8 in total) and with Alba Torrens finding Sandrine Gruda in transition. Before going into the last quarter exciting dunks including an exceptional dunk jumping over a car were shown. By the fourth quarter both teams were attempting many alley-oops with the players showing all their AND1 moves. The Rest of the World team reached the 100-point mark with Quigley scoring a three-pointer. The last quarter should be remembered by the performance of Fowles (left) and her one-handed dunk. She was also named MVP of the game with 16 points and 4 rebounds. The end result, somewhat meaningless, was the victory of the Rest of the World team (116-85).